GUEST BLOG by Eric Peterson, author of “The Dining Car”--I once considered myself a fan of professional football. To this day, at the conclusion of every Super Bowl, I play a fantasy game in my head: Were I a member of the winning team, where would I go for the celebration dinner? Like football, my little game comes with rules. First, the restaurant has to be a top-tier steakhouse. You don’t settle for three here—not after wining a Super Bowl. Second, the restaurant has to be within easy walking distance of the high-rise condominium my wife and I share in San Diego’s Marina District. Being stuffed like a circus clown into an Uber Prius, eating my knees as a starter, and getting whisked to some far-flung outpost is no way to start a special night out. Third, the dinner has to commence at a properly civilized hour—well after 8:00 p.m. This rule applies to all dinners anywhere, I might add, whether eaten in or out, and no matter the season. My wife, Teresa, carries a loaded revolver in her purse. If ever she catches me eating dinner before eight, she has specific instructions to shoot me. As it happens, there are a handful of great steakhouses in close proximity to the Marina District. I’ll warn you, though. If you have to consult the right side of the menu, you’re probably in the wrong place. Fleming’s, Morton’s, Donovan’s, Ruth’s Chris—these are all personal favorites. In addition to their white linen tablecloths and impeccable service, they share two things in common: their food is magnificent, and their glittering martinis induce you to laugh at their larceny. No one steakhouse is without its shortcomings, however, and that is the keynote of the remainder of this wayward column. None of these restaurants requires men to wear jackets, for example, a policy that would markedly elevate the ambiance of any mahogany-walled chophouse. Imagine the horror: You have a starched napkin tucked into your shirt and are about to take a first bite of precious tartare of Wagyu beef when a crush of barbarians crowds the door, dressed in attire that suggests they’ve just come from the upper deck at Petco Park—shorts, T-shirts, ball caps and sandals. But that’s San Diego for you—no dress code, anywhere. Imagine the franchise you could build in America’s Finest City, renting out blue blazers to restaurants. Another common flaw: These steakhouses don’t prepare their Caesar salads tableside, which is the mark of a classy joint. As God is my witness, even the Ranchers Club of New Mexico, in Albuquerque, does a tableside Caesar, and I’m a sucker for it every time. The beauty of a raw egg yolk gliding along the bottom of a vast bowl affords me a visceral pleasure, like watching a sunset. Also, there’s a utilitarian aspect to having the Caesar prepared at my elbow: I can supervise the mincing of the anchovies and garlic to ensure sufficient quantities of both. A proper Caesar salad must be lusty. Superb table side Caesar salad server "Ernest"
Another pet peeve: Whenever I order a New York steak the way it ought to be prepared—rare—the server’s eyes invariably turn up to me, and he says, in question form, “Cool red center?” I bristle. I am nearly sixty years old. I stand 6’3” and weigh a hair short of 250 pounds. Do you honestly think I don’t know what I’m ordering when I ask for a rare New York steak? Speaking of pet peeves, I harbor a severe contempt for overflow dining rooms. The shaky chairs, the cramped tables, the panoramas of windowless walls—these banes of fine dining leave me feeling cheated and miserable before the first course. I am not one for making rules, but overflow dining rooms should be outlawed, violations punishable by long prison terms. I’ll never be a member of a team that wins a Super Bowl, but, ironically, there’s a reason this mother-of-all-celebration dinners has been on my mind. My latest novel, The Dining Car, recently won an award—a pretty good one, at that. It’s an event worth celebrating; I may never win another award. Hell, I may never finish writing another novel. 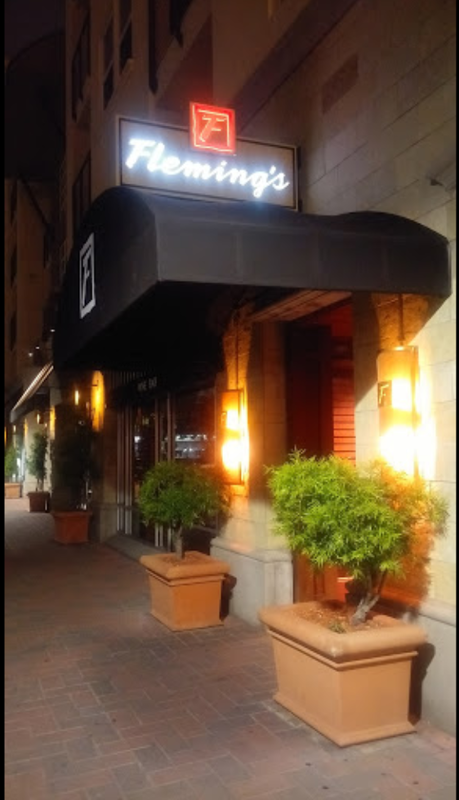 I’ve decided my celebration dinner will be held at Fleming’s Prime Steakhouse and Wine Bar (380 K Street, San Diego). Its red-leather booths, defensible martinis, and sweet chile calamari all factored into the decision, as did a loyal server named Mike, who is a scratch golfer and can tell you the winemaker and vintage of the glass of red that my brother, Chris, overturned one Sunday night three years ago at one of Mike’s tables. Being that it’s a special occasion, I’ll request a booth at the front, where I can peek through the shutters and keep on eye on the passing trains. The steaks at Fleming’s are consistently cooked to perfection. The restaurant offers several options under the banner “steak companions,” one of which is to take your steak Oscar style: garnished with jumbo lump crabmeat and sauce béarnaise. I won’t go for it. That would be like wearing a frilly shirt and tucking your pant legs into your shiny black boots at a rodeo.